First off, I want to thank the great people over at Orbit for the copy of “You Die When You Die (West of West #1), even though I ended up finishing it out via audiobook. This was my first venture in Angus Watson’s writing and it certainly won’t be my last. On top of the upcoming sequels for the West of West series, he has another series called The Iron Age Trilogy, which is another series of speculative fiction inspired by history. The Viking town of Hardwork really doesn’t live up to its name. It is a small Viking village made up of easy going people known as “Mushroom Men” by the towns that surround them and who live fairly toil-free, secure lives. That carefree attitude comes to a halt when the village is attacked and burned to the ground, all thanks to the Calnians and their prophecy that these Mushroom Men will bring about the end of the world. Led by the advice of a slow-witted boy who can see into the future, a small group of villagers have fled Hardwork and headed west. But what are they running from? The Owsla; a group of magically endowed, brutish women who will stop at nothing in order to end the lives of every Hardworker. But where will the villagers go? West, and then west some more until they reach The Meadow. But what awaits them there, and will they be able to outrun the Owsla? Watson’s writing really shines in his character creation, led by the infamous Finnbogi the Boggy. I mean, come on, with a name like that, how could you not fall in love with this book? Whether it is Finn, or Wulf the Fat, or even Sassa Lipchewer, each character has their own quirks, determined path, and humorous personality that just flows throughout the story and adds so much to it. You also have the group of Owsla, each member being vastly different from the other, especially in magic enhancement, source of said power, and attitude. While you find yourself rooting for the Hardworkers throughout the novel, it is hard to not want to see the Owsla through as well. I also want to give props to Watson on his world building and fight scene creation, both of which were top notch. 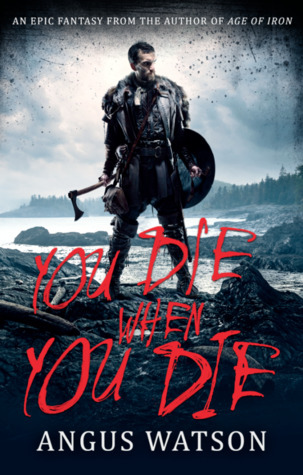 If you enjoyed Watson’s previous series, like stories about Vikings, or need a new author to check out, grab a copy of You Die When you Die. Book 2, The Land You Never Leave, will be released by Orbit on February 22nd, 2018.